1. What Is A Weave Ponytail? A weave ponytail is a type of weft hair extensions that comes in the form of a ready-made ponytail. You can use clips or hair pins to attach it securely to your actual hair. It is made up of natural hair that looks just as realistic as your luscious locks. It allows you to transform your hairstyle daily as it comes in different hair textures like straight high ponytail with weave, wavy low ponytail with weave, and curly weave ponytail. 2. Why Weave Ponytail So Popular? A weave ponytail is one of those hairstyles that have been around since forever. The reason that they never go out style is that they are incredibly versatile, you can wear a weave ponytail to any event you wish. No matter what hair type, color, or length you have, you can always sport a ponytail. People all around the world can rely on a weave ponytail for a comfortable yet chic look. Putting your hair up into a ponytail is a quick and effortless way to look polished and put together. Even though ponytails look perfect on all hair types, you can always use some extra accessories to glam it up a little bit. If you want to change your look up a little or add a diva factor, then a weave ponytail is what you need to have in your life. They are a sleek, chic, and time-saving alternative to our conventional ponytails. If you want to check out how to use and maintain them then keep on reading. 3. How To Install A Ponytail Extension? Installing the human hair ponytail extensions is an easy job as it requires a few simple steps. Here is what you have to do. Step 1: Neatly gather all your hair around in a ponytail and secure it with the help of an elastic band. Make sure your ponytail is tight and firm, so it does not slide down during the day. Step 2: Put your ponytail hair into a bun if you have short hair and you think they might peek through the ponytail extensions. Otherwise, tie your hair into a loose twist and secure the ends. Step 3: Insert the clips of the ponytail extension on your bun or secure it tightly with a drawstring and lock it in place. Step 4: For extra thickness, you can use one more bundles of Recool weft hair extension and attach them into the previous ponytail extensions that are already installed around your natural hair. Step 5: Take a section of hair from the ponytail extensions and wrap it around the ponytail band for a polished and sleek look. Step 6:Tame your hair with the help of gel or hairspray to finish off the look. This process will make sure your drawstring ponytails stays on your hair for a long time. 4. How To Style Your Braided Ponytail With Weave? The weave ponytail is a hairstyle on its own, but if you would like to take your hair game up a notch, then you can add braided accents to your ponytail as well. Instant of wrapping a plain chunk of hair weft around the band of your ponytail, you can braid that section and carefully wrap it around your ponytail for an interesting texture and character to your hair. 5. How To Care For Ponytail Hair Extensions? Weave ponytails can be worn for an extended period. However, prolonged usage of these ponytail hair extensions can cause breakage and buildup. Periodically wash your human hair ponytail extensions with a gentle hair cleanser and condition them as you would do with your natural hair. Let the extensions air dry and style them with heating tools. If your weave ponytail is made up of human hair, make sure to read the instructions before you apply any heat to the hair. 6. What Is The Best Weave Hair Extension To Use To Make A Ponytail? A weave ponytail can literally change the way your everyday look comes together quickly and conveniently. No matter if you are a lover of the high fashion weave ponytails with bangs or want weave ponytails with tracks, Recool has an awesome selection of ponytail extension human hair for black women that will help you create an amazing look. Our choices of weave hair extensions come in a variety of hair textures and patterns such as loose waves, Jerry curly or a straight natural texture. What’s better is that they come in a multitude of beautiful colors so you can easily match your natural hair color. Finish off your look with an amazing natural hair ponytail with ease and style. 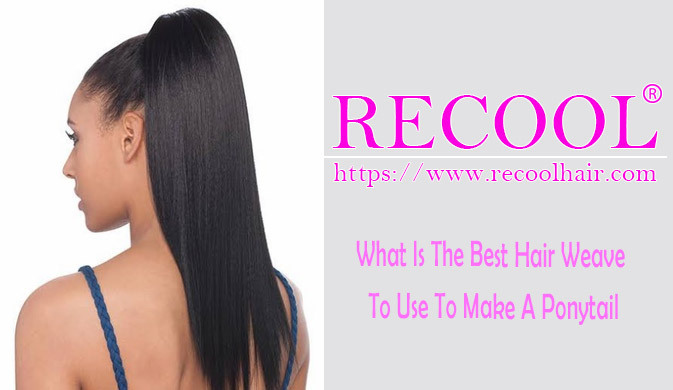 Purchase your next weave hair extensions online with the help of Recool!